So I'm back with yet another tank. This was my turtle tank but the turtle has now grown large enough to be moved to my backyard pond so I decided to plant this tank as a planted grow out tank. 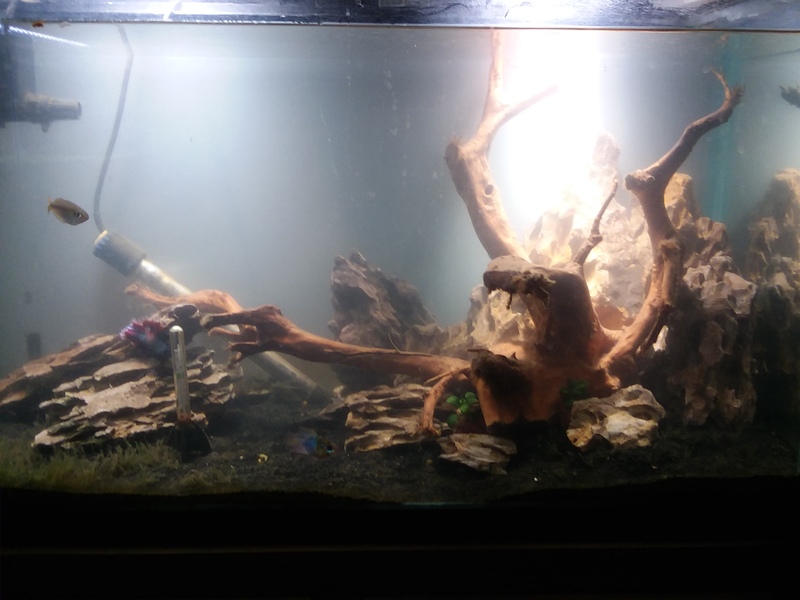 The middle of the tank has no soil under the gravel as I was thinking of doing a kind of riverbed look but I've decided not to. I'm now looking for a foreground or mid ground plant to place there so if anyone has recommendations I would greatly appriecate them. im just doing a link to the image this time. for some reason if i do an html link to the image it wants to make it so big its like 3 times the size of the screen. if anyone has a fix for this please let me know. That’s a nice start. The Pogostemon will fill up that corner pretty quickly. Since you are linking to images hosted on Imgur, for the links ending with “.jpg” you will want to use the IMG tags since this is pointing to a specific file. If they don’t end in JPG then you will want to use the HTML tags. I've had good luck with Micranthemum 'Monte Carlo' for carpeting. Would be a very different texture and slightly different (brighter yellow-green). I've got some over black sand and it looks great. You could always add some driftwood in there with an interesting shape that would overlap the other planted areas. Dunno how it would look; you'd have to give it a go. thanks for the recommendations. the monte carlo does sound like a good option. ive never tried growing that before. any special needs for monte carlo? 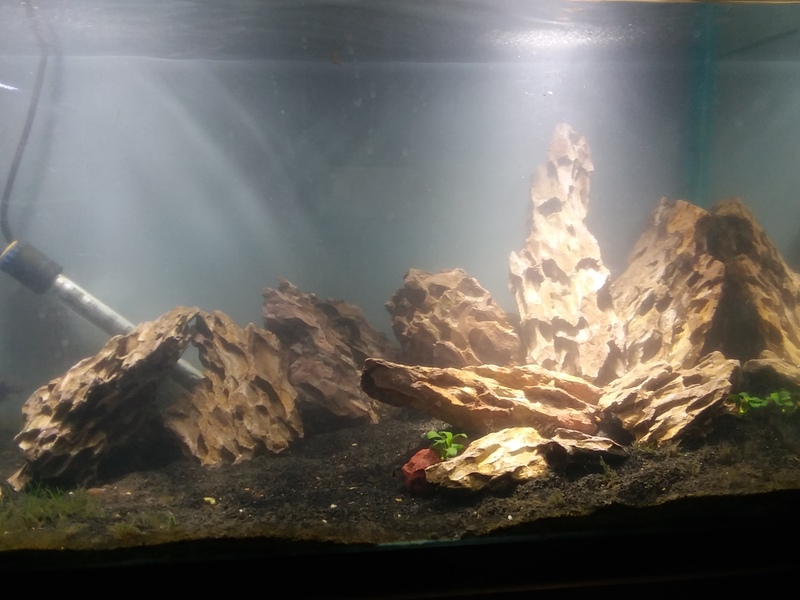 driftwood doesnt sound bad either though since i now have 4 tanks that are rockscapes and only the one that has any driftwood in it. ill have to go monday and see if my lfs has gotten anymore spiderwood in. any special needs for monte carlo? Well...it's growing like mad in my super high-light CO2 tank... but I've had it grow slowly in a medium light CO2 tank. If you're getting that Utricularia to grow, I think you'll be able to get some Monte Carlo to grow, too. Bit of a change in this tank. I bought a 30 gallon plastic storage container and moved all the plants in this tank over to it. Now I'm working on scaping this tank using dragon stone. I have 2 possible setups here and would like to see which one you guys like. also whichever you choose if you see anything wrong with the layout let me know. First one has great wood and I’m a fan of dragon stone. Wood is hiding too much of the stone though. I’d try to get the wood further back and get a stone at the base of the wood. Show off the rock a bit more. Definitely more of a nature aquarium vibe. Second one is a promising iwagumi style. You’ve got the 1/3-2/3 division really well. I’d suggest trying to have the rocks to the left of rev divide pointing to the right. Rocks to the right pointed left and/or up. If you do some wood in this one you’ll maybe need to get enough to place pieces on both sides of the divide. Might work asymmetrically if you use smaller pieces cut from the big one. Either way you’ve got really nice materials and a good sense for proportion and style. Ty very much for the input. What did you mean when you said rocks to the left of rev divide? I'm going to play around with the scape more this weekend. I will definitely keep your tips in mind. I marked up your photo to try to illustrate more what I was thinking. Red is one way to angle the rocks. Green is another way to angle the rocks. It's sort of like someone cut a valley through a fractured up mountain. Just google "iwagumi rock placement" and you'll be able to find some images with the actual terms applied to the various stones in an arrangement according to Japanese gardening principles. It's cool, but maybe more in-depth than a lot of us want to get. Bottom line is that if YOU like how it looks, then that's how it should be done.